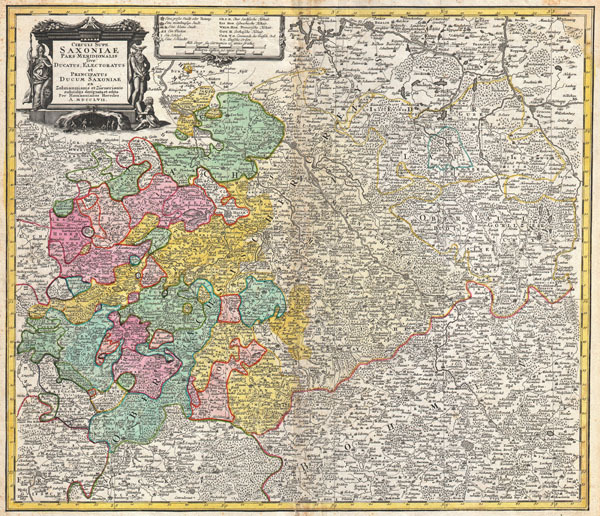 A fine example of the Homann Heirs map of Saxony, Germany. Covers from Berlin in the north, to Prague in the southeast and Efurt in the west. The map is filled with information including fortified cities, villages, roads, bridges, forests, battlefields, castles and topography. Title cartouche in the upper left quadrant features a wonderful mining vignette, the Greek god Hermes, and a warrior figure with a shield featuring the head of Medusa. Prepared in Nuremberg by the engravers Adam Friedrich Zürner and Zolman for issue in Homann Heirs' Maior Atlas Scholasticus. Adam Friedrich Zürner (1679 - 1742) was a German engraver, pastor and scientist based in Dresden Germany. His is known to have worked with the Homann Heirs firm as well as several other cartographic firms of the era. His cartographic work primarily focuses on Saxony and parts of Germany. Stanford University, Map Collection, Germany 0307.